Christina Weaver, a freelance writer for the Coastal Point, is among the winners of the Rehoboth Reads writer’s contest this year. 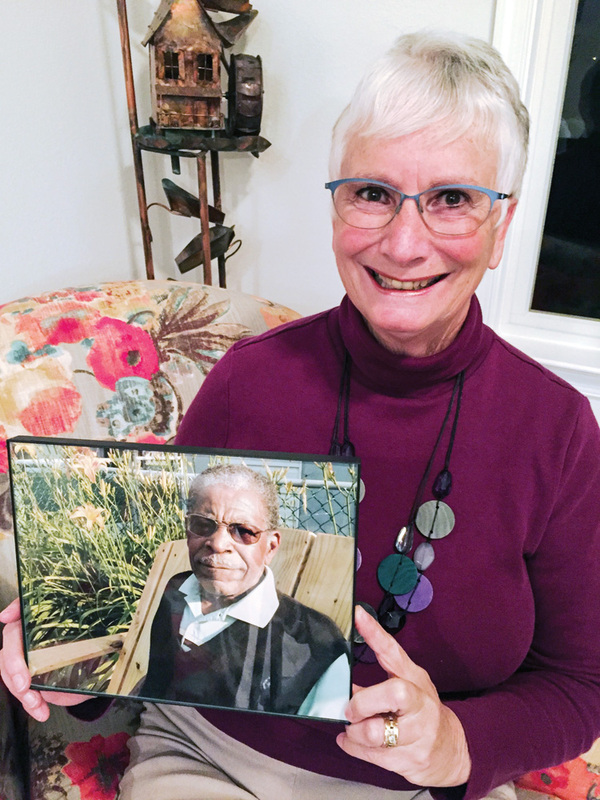 Here she is pictured with a photo of her late husband, Ike, who is featured in her winning essay. Three winners have been announced in the inaugural Rehoboth Reads Writing contest, sponsored by Delaware Beach Life and Rehoboth Reads, the project launched in December 2018 that involved the city-wide reading and discussion of a single book, “Just Mercy” by Bryan Stevenson. The winners in each category — short story, poetry, and nonfiction — were chosen by guest judges who sought pieces that were not only well-written but also addressed in a unique way the contest’s theme of redemption. The winning entries, along with the judges’ comments, will be published in the May issue of Delaware Beach Life. The judge for the short-story category, crime writer, director and producer George Pelecanos, chose “All Alone in Bed” by Andrew Kleinstuber. Kleinstuber, a University of Delaware graduate who majored in history but found himself “writing novels instead of studying,” currently lives in Fenwick Island and is the founder of DAM Good Productions. “All Alone in Bed” is Kleinstuber’s second publication. His first publication, also the result of a contest, and also the recipient of an award, was for the short story “The Beginning of Everything,” which appeared in the anthology “Beach Fun,” published in 2018. The judge for the poetry category, poet, playwright and University of Delaware professor Jeanne Murray Walker, chose “Water Wings” by Willie Schatz, who has been writing professionally for more than five decades. After receiving his juris doctorate in 1973 from Georgetown University Law Center, where he was the editor of the Georgetown Law Weekly (not to be confused with the Law Review), Schatz spent four years as the staff counsel for the National Alliance for Business before yielding to the journalism muse that had been shouting to him for a decade. Since heeding those pleas, he has covered business and technology for the Washington Post, sports for the Miami News, the New York Daily News and the Morning Call (Allentown, Pa.). He has written about, analyzed and dissected national technology policy for numerous other publications, and for 20 years he taught journalism and English at the University of Maryland. Schatz is also an editor, an executive writing coach for public- and private-sector clients, and the Artist-in-Residence of the Writers’ Group at Street Sense, a biweekly street newspaper that examines issues for people facing homelessness in Washington, D.C. He recently began a writers’ group at Charlie’s Place, another D.C. organization serving the housing-challenged community. Schatz also served a two-year term as president of the D.C. Pro Chapter of the Society of Professional Journalists (SPJ). He spent two decades at the University of Maryland, College Park, teaching journalism and three courses in the Professional Writing Program of the Department of English Language & Literature. Schatz and his spouse, Molly, live in the Adams Morgan section of Washington and also own a house in Lewes. The judge for the nonfiction category, Sam Calagione, founder of Dogfish Head, chose Christina Weaver’s “Driving While Black & Other Indignities.” Weaver is a retired registered nurse and healthcare executive who, with her husband, relocated to Bethany Beach from metropolitan Washington, D.C., in 1998. Weaver has written numerous feature articles for the Coastal Point newspaper in Ocean View, and authored a memoir, “What You Lose on the Roundabout, You Gain on the Swings,” about a 10-year misadventure with Parkinson’s disease. She was an original member of the Rehoboth Beach Writers Guild, is an active member of the Sussex County Democratic Party and a devoted fan of the band Lower Case Blues. The winners will be reading their work at a reception on Tuesday, May 7, at the Forgotten Mile Ale House in Rehoboth Beach from 6 to 8 p.m. Terry Plowman, publisher of Delaware Beach Life, and Maribeth Fischer, founder and executive director of the Rehoboth Beach Writers Guild, will introduce the event, and musician Stuart Vining will perform songs specifically chosen to accompany each reading. The event is free and open to the public, although seating is limited, and RSVPs are necessary (email fischer.maribeth@gmail.com). Attendees may order food and beverages throughout the event. For more information about this or about the Rehoboth Reads One Book: One Community initiative, go to www.rehobothreads.com.